For the cakes themselves, think simple yet still stunning. We love how Rosycakes lends an understated elegance to the whole vignette. 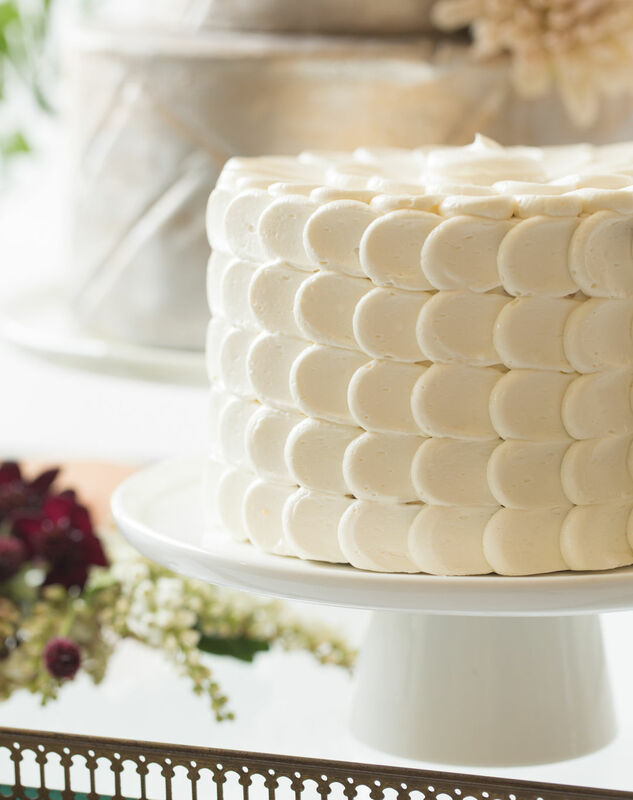 And with flavors like pumpkin spice, coconut, and lemon curd waiting inside, your guests will really be in for a treat. Frenchie brass cart and gold cake serving set from Classic Vintage Rentals. Linen napkin from Barclay Event Rentals. Cake stands and candleholder from Bridal Bliss. Vases, florals, and greenery from Honor flowers. Breaking up your reception space with some cozy lounge seating? Elevate your social space by turning it into a full-on desserts post. The intimate appeal of some plush sofa cushions keeps friends and family from feeling forced back to their tables once the cake is cut, and encourages more mingling (busting out the champagne during dessert helps with that, too!). 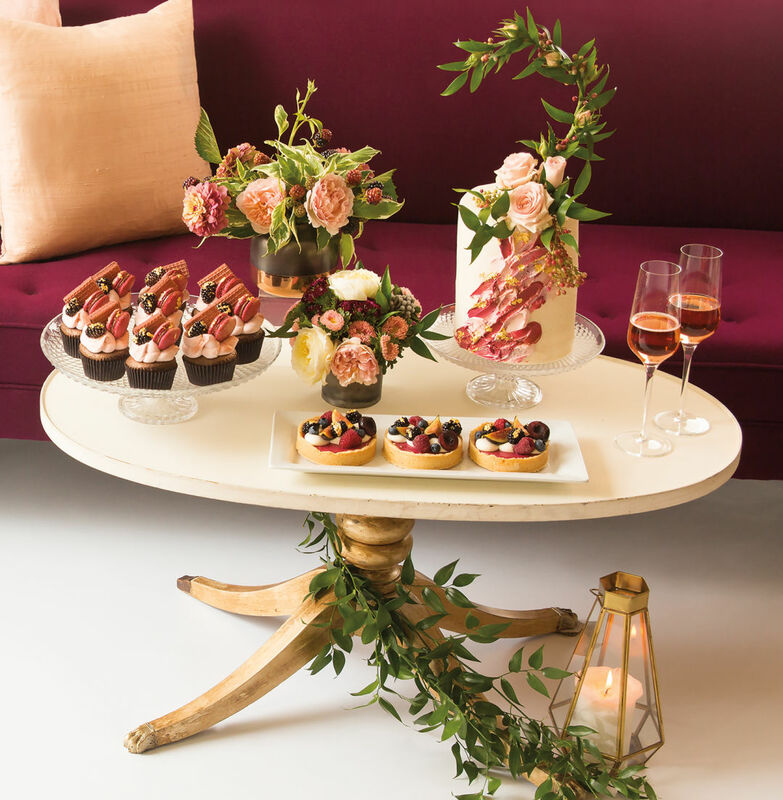 “Creating a dessert lounge serves as a fun focal point for the reception,” notes Elizabeth. “We loved the idea of guests grabbing a sweet and taking a seat to enjoy!” Above, Jewel-toned sweets from Alex Wilson, owner and pastry chef at The Hungry Hero in Sherwood, make for a dramatic desserts-lounge display. The blackberry-hazelnut cutting cake (topped with a fascinator-inspired floral sculpture by It’s All Arranged) features flakes of gold leaf and a waterfall-like cascade of color, while chocolate cupcakes dressed in blush buttercream, fresh blackberry, chocolate wafer cookie, and a cranberry-colored salted fudge macaron make for an artfully delicious presentation. Dixon sofa, pillows, and Colette coffee table, from Classic Vintage Rentals. Champagne flutes from Barclay Event Rentals. Glass cake stands, white tray, lantern, and candle from Bridal Bliss. 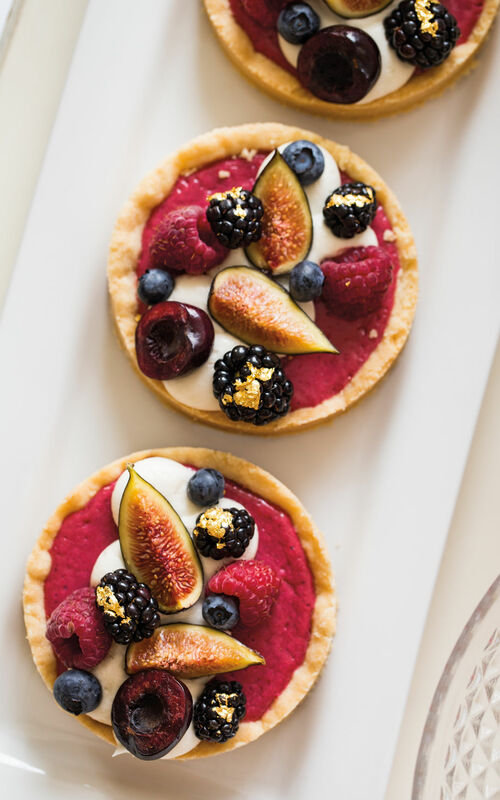 Cranberry curd baked into an almond-scented shortbread crust topped with freshly whipped cream and a smattering of figs, cherries, and gold leaf-dressed blackberries from The Hungry Hero are mini works of art. 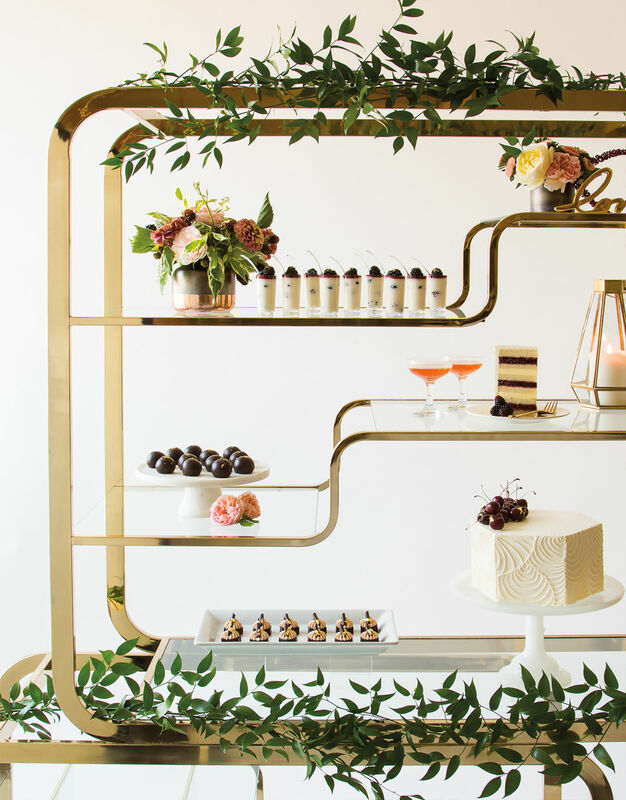 “We love the idea of using shelves to display desserts,” says Nora, who suggests keeping the treats nicely spaced out so there’s room for hands and tongs to reach in (also make sure any candle flames are on the edges or in the back!). She recommends selecting sweets that you love as a couple, which helps make the spread feel unique with personal touches. In this gilded display, Ashley Wilson, pastry chef at Papa Haydn East, offers up a little bit of something for everyone. Above, clockwise from top left: cappuccino brownies with cinnamon cream cheese; panna cotta shooters with fresh berries and blackberry gelée; bourbon balls with dark chocolate ganache and flecks of gold leaf; hexagonal vanilla cake with almond custard and cherry-cabernet compote covered in Italian buttercream with a piped fan design. Milo étagère, marble cake stand from Classic Vintage Rentals. Champagne coupes, cake plate, gold forks from Barclay Event Rentals. Assorted gold accents, white cake stand, candle, and lantern from Bridal Bliss. Vases from Honor. Lauren Carper, of floral company Honor, adds a romantic whimsy to the dessert displays with her arrangements of pink asters, gray Brunia berries, burgundy sweet William, locally grown blush garden roses, zinnias, weigela, and local blackberries, and trailing garlands of Italian ruscus.